"As for hallucinations, there is nothing more common." ??? Two point you failed to mention: 1. Alcohol is not a hallucinogen, it's a depressant. You will not and cannot hallucinate by drinking. The only way it's psychoactive at all is by a loss of mental perception. 2. Thujone is not a hallucinogen. It's a convulsant. El, I believe you missed the context of that statement, which is end stage alcoholism and DTs. 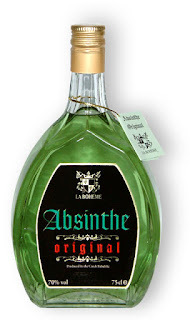 The enemies of absinthe at the time were using studies of end stage alcoholics and their symptoms as propaganda, spinning them in a way to try to make absinthe out to be the culprit. Which the Lancet saw through.